How much does it cost to travel to La Plata? How much money will you need in La Plata? 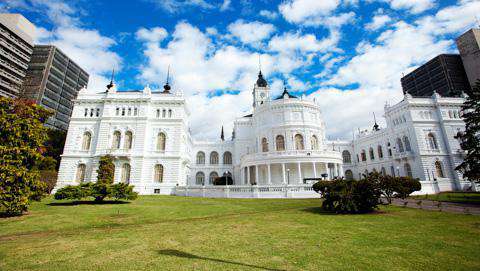 AR$2,253 ($54) is the average daily price for traveling in La Plata. The average price of food for one day is AR$640 ($15). The average price of a hotel for a couple is AR$2,102 ($50). Additional pricing is in the table below. These average travel prices have been collected from other travelers to help you plan your own travel budget. How expensive is La Plata? How much money do I need for La Plata? Just over an hour from Buenos Aires, the bustling university city of La Plata is notable for being South America's first planned city. Indeed, also known as the City of Diagonal, La Plata's intricate grid system includes diagonal streets that run through it, contributing to easy navigation but confusing intersections.La Plata is the Capital of the Province of Buenos Aires, the main Argentine state, so you will find lots of elaborate government buildings alongside leafy green plazas in this laid back as well as active city. La Plata is a happening university town with a population of over 700,000. You can walk the width of it in under an hour, stopping at trendy craft beer bars, local music joints, and great restaurants along the way. Also, football is a religion in Argentina and if you're looking for some local atmosphere, La Plata is the place to go! Two of Argentina's biggest football teams, Gimnasia y Esgrima La Plata and Estudiantes de La Plata challenge each other each year. If you are around during that special day for the city, you will witness thousands of fans wearing the relevant colours heading off to watch the match and parade by calle 7. La Plata has very interesting architecture, which makes it the kind of city where you will simply want to wander up and down the big sidewalks and enjoy the beautifully-designed and varied buildings. If you have time, head to La Plata Casa Curutchet, the only house in all Latin America designed by the famous Swiss-French architect Le Corbusier, often considered as one of the pioneers of modern architecture. Check out La Plata's park, east of the centre, which is probably one of the most beautiful places in the city. The 'bosque' hosts the stadium of the local football team 'Gimnasia y Esgrima La Plata' but also the museum of natural science, the zoological gardens and the observatory. Everyday the park is filled with thousands of Argentinian enjoying a cup of mate, doing their daily jogging, studying, relaxing or playing a picadito, an informal football match. Plants and flowers from all different parts of South America find their home here in el bosque thanks to the work of a dedicated local scientific community. Another sight not to be missed in La Plata is its Cathedral. From the viewpoint located in the "Tower of Jesus", it is possible to see the coast of Colonia del Sacramento in Uruguay on clear days. Inhabitants of La Plata are extremely proud of their Natural History Museum. It has plenty of dinosaur skeletons, a detailed permanent exhibition on the numerous pre-Columbian cultures in south America, and other world class exhibits. Located in the green parks north of the city centre, the entry costs USD$2. For art-lovers, the Museo Municipal de Bellas Artes has a small exhibition space displaying temporary contemporary art exhibitions. La Plata is also a haven for science freaks, as it has one of the most important universities in Latin America, a beautiful Museum of Natural Science and an Observatory, which is open most days and offers guided tours. The Scientific tour includes the visit of the 1883, pure Victorian style Observatory building, the museum of astronomy and geophysics and the room of the telescope, El gran Ecuatorial. If you need to get out of the city, within just a few minutes from La Plata you can find lots of places to enjoy a day in the countryside. Discover the gaucho world with an afternoon of horse riding, stuff yourself with a delicious asado, relax in a swimming pool or test your limits with aviation sports such as hang gliding. Barbecue, burgers, seafood and traditional meals make up the La Plata's food scene. Farmers markets with locally grown produce and fresh meats are also very popular in the city. You will have a great list of restaurants, bars, clubs and cafes to choose from during your stay in La Plata. In the very centre of the city there are a lot of pubs, classy bars and upper-class restaurants and the further you get out to the suburbs, the more you will find rock and indie bars heading towards the shady look. The Old Station District is the student's favourite area, as it holds plenty of cool charismatic pubs and some great live music. Buses from Buenos Aires Retiro station to La Plata cost USD$2 with your SUBE card and take between 1 to 2 hours depending on the route and traffic. The two main bus services are Plaza and Costera and leave Buenos Aires every 20 to 30 minutes each day from 5h30 to 22h30. Other Argentinian cities offer bus services to La Plata but the majority of the rides, especially from the north, are not direct and most of them stop in Buenos Aires. You can also rent a car and take the highway on your own to reach La Plata. However because the bus is a rather simple and cheap option and La Plata is an easy city to navigate by foot because of its grid system, it is not necessarily recommended to rent a car for this trip. In La Plata, you can walk from one side of the city to another within 45 minutes. Taxis are plentiful, cheap and can be hailed on the street. Make sure to stay vigilant as the diagonal avenues that cut through La Plata can be confusing and taxi drivers will often take advantage of that to increase the price on the meter. The city buses (micro) are cheap and reliable. Prices are based on distance travelled, starting at 6 pesos for up to 3 km and 7 pesos anything over 27 km. You must specify the destination upon entering the bus and the driver will charge accordingly. You can buy a prepaid Sube card (valid for La Plata, Buenos Aires and travel in between) at any news stand for 25 pesos. You must also hale the bus as it passes the bus stop or it will continue its route.